Most of the previous adaptations of Agatha Christie’s classic courtroom drama, such as Billy Wilder’s classic Oscar-nominated movie, have been based on Christie’s stage play. The recent BBC telemovie, in comparison, is based strictly upon Christie’s original short story. The basic story remains the same: a young man is accused of murdering an older woman who had named him as her heir. His lawyer believes strongly in his innocence and expects that the accused man’s wife will provide him with an alibi, but the mysterious spouse provides some unexpected testimony. There are some significant differences between the short story and the play. In the play, the central character is the barrister who leads the defense in the courtroom. In the short story, the main character is the solicitor who first takes on the case and organizes the research to exonerate his client outside of the courtroom. Christie added a final twist to the play version, as well, so people who know the story solely from the play or the film adaptation should know that this television production is substantially different. Screenwriter Sarah Phelps, who also wrote the adaptation of Christie’s And Then There Were None last year (https://strandmag.com/dvd-review-and-then-there-were-none/), has deeply expanded the short story. While other adaptations are set in the post-WWII era, the short story was meant to be set in the fallout of WWI, and the telemovie adjusts the time accordingly. Most of the plot points featured in the telemovie are based on little incidents in the story. For example, the solicitor’s cough, fleetingly referenced in the original short story, becomes a lingering condition from being exposed to poison gas in the first World War. The solicitor’s marriage is explored in further depth, as is the connection between the victim and her maid as well as the fallout of the verdict. The acting is particularly strong. Toby Jones continues to be an acting chameleon as the solicitor John Mayhew, a mild-mannered man who is painfully aware that his career is middling at best, and who channels a passion he previously would not have thought possible into vindicating his client. Andrea Riseborough as Romaine Heilger plays the titular role with an impressive level of shrewdness and graceful slyness. Kim Cattrall plays the victim, Emily French. Earlier adaptations have portrayed French as a dotty, fluffy old lady. Cattrall’s portrayal of the role depicts a far more confident sexuality, a woman who is fully aware of the power that her wealth brings, and how it allows her to attract the young men she craves. Monica Dolan returns to Agatha Christie after her stellar performance in the Poirot episode After the Funeral as the maid, and she manages to blend menace with convincing fear for her position, along with palpable mental instability. Much like last year’s And Then There Were None, Witness for the Prosecution goes for a darker tone, visually and thematically. Artistically, it’s a triumph. It explores the emotions and social disruption that Christie often incorporated into her work, though unperceptive critics tend to overlook this depth. At the same time, I would not be surprised if many Christie fans, who derive happiness and comfort her work and its adaptations, were to be turned off by the bleakness and emotional despair that punctuate the production. 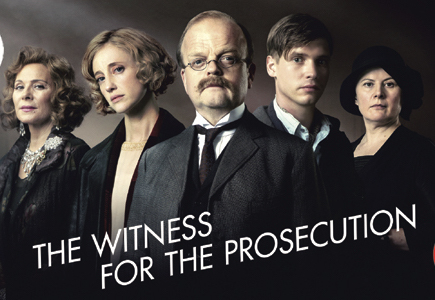 Ultimately, Witness for the Prosecution is propelled by the feelings, hopes, and personal failures of its characters. For me, the explorations into the dark and damaged hearts of the cast make this a production to remember. Other people might find the narrative’s direction depressing. Personally, I appreciate the attempts to expand the artistic and human aspects of Christie adaptations, though I would stress that many of Christie’s fans come to her work seeking joy, and that darkness is not always the way to go with adapting her work.